Harmony House is a transitional housing program with the primary goal of helping families move from homelessness to permanent housing and from dependency to self-sufficiency. With the capacity to house 102 families in individual apartment units and a host of on-site social services, Harmony House provides much more than a shelter. It offers stability to families facing seemly insurmountable barriers and enables them to restore their lives. As the largest transitional living facility in the country, Harmony House has earned an excellent reputation for the array of effective and comprehensive services it provides to homeless families and children. Residents are encouraged — and in many cases are required — to take advantage of the child care, job training and other resources available to them through the New Community network. The length of stay at Harmony House is determined by individual circumstances but the average stay ranges from six to nine months. The Crisis Text Line is a service now available to residents of Newark where any resident can text “NEW” to 741741 when in crisis anywhere, anytime and a live, trained counselor will assist you. The Crisis Text Line is available 24 hours a day via text messaging through CTL’s secure platform. Read more info here. 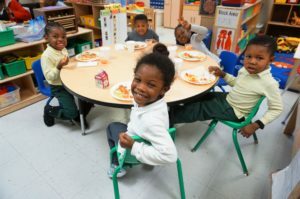 Harmony House Early Learning Center provides care and early education for children ages 3 months to 5 years old. Many qualify for free care and schooling under the NJ Abbott. * The Foster Grandparents program places eight grandmothers in the classroom to provide special loving care. * Even Start Family Literacy Program, funded by the New Jersey Department of Education, assures children and their parents a better academic future by introducing an integrated family literacy.